Mickey Mantle hasn’t had any new cards made for about five years. The Mantle Estate parted ways with Topps after 2012 claiming the market had been too saturated with his cards. Personally, I believe it was all over money. During that time, no manufacturer was allowed to print cards of the great #7. His estate seems to be loosening up a bit. 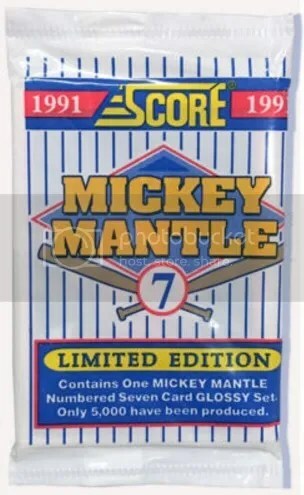 This week we learned new Mickey Mantle cards are going to be offered through the Panini Eternal line of collectibles. Panini can make cards of him, but none of them will contain a Yankees name/logo. Mickey Mantle and the Yankees. Yankees and Mickey Mantle. They go together like peanut butter and jelly. It looks odd. Mickey Mantle would’ve fit well into the Topps Now program. Unlicensed Mantle cards kinda makes the family look desperate. Although Topps isn’t the only company to make cards of Mickey Mantle over the years, its the first manufacturer I think of when it comes to his stuff. For a brief moment in time, it was possible to pull authentic on-card autographs of Mickey Mantle. Today’s collectors are mostly likely use to seeing his autographed cards come in the form of cut signatures, but it didn’t start out like this. Mr. Mantle was around long enough to see the start of pack inserted autographs before passing away in 1995. Collectors opening packs of 1991 Score Series 2 have the opportunity to pull an autograph of Mickey Mantle. They’re individually numbered out of 2,500. I can’t tell you how many might be left in packs, but it wouldn’t surprise me if a few were still hiding in there. In addition to those autographs, that second series also had seven Mickey Mantle inserts. Score sent out a special version of these inserts to dealers, members of the media, and whoever else was on their mailing list. All seven cards came packaged in a pinstripe promo pack. The cards inside look almost identical to the ones found in the standard second series packs. Other than the serial number, Score’s name on the back is surrounded by a red box. Five thousand of these sets were produced. I don’t believe its possible to find any Mickey Mantle autographs tucked away inside these promo packs. Sealed promo packs cost about $20 each.